The Class of 2017 is helping out the Winston-Salem community this week by volunteering with Habitat of Humanity of Forsyth County. 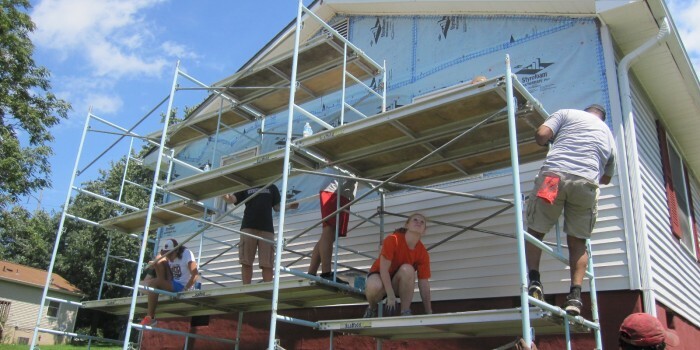 Each of the four sections of new JD students will spend a morning or afternoon on Wednesday, Aug. 20, and Thursday, Aug. 21, along with faculty members and law school administrators, working to improve Habitat homes in the area of 14th and Cherry streets. WINSTON-SALEM, N.C. — The Wake Forest University School of Law welcomed its newest juris doctor (JD), Master of Studies in Law (MSL) and international students for the 2014-15 academic year beginning Friday, Aug. 15. The entering JD Class of 2017 is made up of students representing 119 colleges and universities from 32 states, Puerto Rico and three foreign countries. The class is 48 percent women and 18.4 percent of the class is made up of diversity students. And there are at least 14 students with graduate degrees. New international students come from more than a dozen countries including Afghanistan, Burundi, Chad, China, Holland, Kosovo, Palestine, Panama, Peru, Saudi Arabia, and South Korea. Among the LL.M (Master of Laws) students are four men from Kosovo, who represent the third group of students from their country to study law at an American university, according to the Dean of International Programs Richard Schneider. “We have a really wide spectrum of students from around the world and they bring great experiences to this law school,” he added. Barkley, along with her classmates, is helping out the Winston-Salem community this week by volunteering with Habitat of Humanity of Forsyth County. Each of the four sections of incoming JD students will spend a morning or afternoon on Wednesday, Aug. 20, and Thursday, Aug. 21, along with faculty members and law school administrators, working to improve homes in the area of 14th and Cherry streets. The entering law school class has been volunteering with Habitat for more than a decade, according to Associate Dean of Administration and Student Services Ann Gibbs.